A physical exam alone may not reveal all the symptoms an ill pet is experiencing. 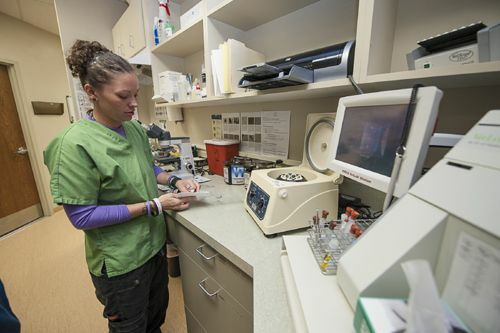 Our advanced diagnostic laboratory allows us to analyze samples of your pet’s blood, feces, or urine and have results available in a matter of minutes, allowing us to diagnose and treat a wide range of illnesses quickly and accurately. Routine laboratory testing aids in the early detection and treatment of internal parasites, diseases, and other health problems, often before you pet is showing any symptoms - and is an important part of your pet’s wellness visit. For specialized testing and analysis, we partner with outside diagnostic laboratories, with most results available within 24 hours.